BOLT Lock, Jeep Wrangler TJ Jack Mount, Jeep Wrangler JK Jack Mount and the Jeep Wrangler JL Jack Mount attaches directly onto the Jeep Wrangler A Pillar, can be used to secure jacks including the Hi Lift Jack and work with YOUR Jeep Wrangler Ignition Key. Secure your Hi-Lift Jack with your Jeep key. Hi-Lift Jack held securely in place with 2 knobs. Easy to remove and mount your Hi-Lift Jack. Please select the Hi-Lift Jack Mount for YOUR Jeep Wrangler. Please note the Jeep TJ Wrangler and the Jeep JK Wrangler have the same ignition key and the Jeep JL Wrangler has a different style key. 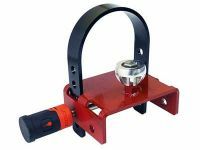 BOLT Lock, Jeep Wrangler TJ and JK A Pillar Jack Mount attaches directly onto the Jeep Wrangler A Pillar, can be used to secure jacks including the Hi Lift Jack and work with Your Jeep Wrangler Ignition Key.